Do you work at TOZI? What did you think of TOZI? The colourful warmth of the Venetian dolce vita meets London's sleek sophistication. Situated in the Park Plaza Hotel in Victoria, Tozi serves exquisite cicchetti and wood-fired mains alongside cocktails and vino to spare. 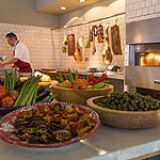 Although technically situated in a hotel, this restaurant is in no way generic or lacking soul; in fact, Tozi's food, ambiance and staff have character and personality in spades. Warm, rustic accents are set against a chic and modern design giving a sense of relaxed elegance. The space is delineated well into an informal bar area, a spacious dining room and a separate communal table for larger groups. 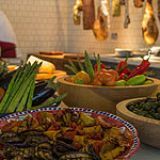 With an emphasis on homemade ingredients and fresh authentic imports, Tozi features a prominent open plan kitchen allowing diners to witness the art of fine food preparation whilst eagerly awaiting the next plate of delicious cicchetti. Upon entering the lively buzz of Tozi on a weekday night, diners will find an atmosphere of warmth and bonhomie. 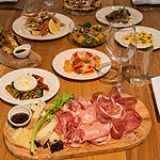 As the name suggests to those au fait with Italian, Tozi (group of friends) emphasises the social: the sharing of food, drink and conversation. A strength of this restaurant is its staff. Food emerges from the kitchen with flair and pride, and almost always with narration. Curious about the lemon sorbet? A fresh Amalfi lemon may be presented to you, leaf still attached. Wondering about the consistency of a particular pasta? A lively explanation of it's shape under a microscope might even be provided. With its smart casual ambiance, Tozi would suit intimate dates, group dinners, after work drinks (with bites), and is a venue that goes seamlessly from day to night - very handy in this part of town. As plates are small and meant for sharing, it's best to order a few. 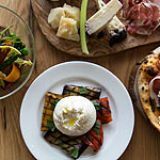 Try the burrata with Mediterranean grilled vegetables (£7.25) - it's excellent. Italian for 'buttered', burrata is soft, creamy and incredibly fresh, with a delicate skin and almost liquid centre. It has a stronger flavor than mozzarella and an interesting texture combination as it literally oozes with creaminess. The buffalo riccota ravioli with black truffle (£7.50) also impresses, served in a sinfully buttery sauce while the truffle notes add a smooth earthiness. Seafood choices abound. The salt cod agnolotti combines fresh pasta with the saltiness of the fish (a great excuse for a slurp of wine) impeccably. The spaghetti allo scoglio is bursting with fresh seafood, and the pasta is cooked to a delightful al dente texture that doesn't absorb the fine, light sauce. From the grill, the octopus with taggiasche olives (£7.75) is deep fried to crunchy, and is certainly very flavorful. The swordfish in the caponata (£7.25) is flaky and light, but the real highlight is the tangy, sweet vegetables in the stewed caponata itself - this traditional Sicilian aubergine dish is done very well indeed. The ox cheeks with wild mushroom jus (£6.25) should definitely be tried too. The extremely tender, baked meat melts in the mouth in a flavorful sigh - it really does prove a dish difficult to share. So don't bother. Dessert options are numerous and impressive - again, ask for recommendations. The burnt cream, rhubarb biscotto (£4.50) is tantalising, with the real stand out being the burnt cream element (it's an Italian crème brûlée, essentially); lush and not too sweet. The chocolate delice (£5.50) is moist and decadent while the selection of ice creams and sorbets (£4.50) is a good palate cleansing option and a joy to suss out each very fine flavour (passion fruit Campari, and lemon basil for example). 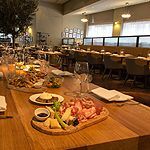 With an extensive wine and cocktail list, as well as homemade oak-aged Negroni and prosecco on tap, drinking at Tozi is an equally delightful activity. Start the meal with a Tozi Spritz (highlighting fresh watermelon, Aperol and processco) a refreshing drink that goes down a little too easily. Guys, impress your date with the Sir Negroni (as masculine as the name suggests), it's strong with a hint of citrus. Separated by colour and characteristics, the wine list features an impressive collection of whites, reds and succulent dessert wines. A 'fresh and aromatic' white is the Vermentino di Sardegna, Villa Solais, Santadi, which at £7.50 offers pretty good value, too. With light, apple notes, this wine goes very well with many of the seafood dishes. Once the last of the dinner plates is cleared away, the extra table space is a perfect excuse to order another Negroni or a signature cocktail, so feel free to do just that. With consistently impressive food, a relaxed but professional atmosphere and an amiable and knowledgeable staff, Tozi is a venue to book with confidence. Food here is an art and a joy. Disgusting double service charge rip-off and customer gouging. The food is low quality but expensive - fesigned for the tourist rip-off. Beware of the double service charge rip-off. 12.5% on the bill without asking and a further request for 10-20% on the Visa\ MasterCard payment. Disgusting customer gouging. Average low quality food at expensive prices for unsuspecting tourists. Not recommended.